Why Are Bank of America's Shares Still So Cheap? 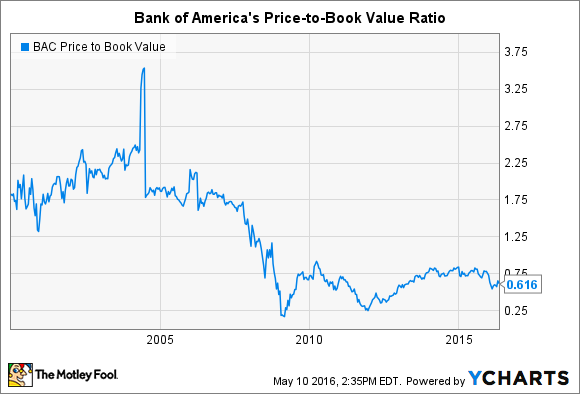 Bank of America's shares haven't traded at book value for nearly a decade. Shares of Bank of America (NYSE:BAC) are incredibly cheap right now, at least according to traditional valuation metrics. Its price to book value ratio is a mere 0.62, meaning its stock trades for a 38% discount to book value. That's cheaper than any of Bank of America's principal competitors, including Wells Fargo, JPMorgan Chase, and Citigroup. The price to book value ratio is the most popular metric for assessing the value of bank stocks. It compares the price of a bank's stock to its book value per share and is calculated by dividing the former by the latter. Bank valuations fluctuate depending on where we are in the business cycle -- or, more specifically, the credit cycle. When business is booming and loan losses are low, bank stocks trade at higher valuations than when the economy is heading into a recession and loan losses are increasing. In Bank of America's case, its shares regularly traded for more than two times book value in the lead-up to the financial crisis of 2008. Since then, however, its valuation has failed to eclipse one times book value, a commonly cited benchmark that differentiates between banks that alternatively create and destroy shareholder value. BAC Price to Book Value data by YCharts. There are two reasons Bank of America's shares are currently trading for such a low valuation. The first is that its business model has changed over the past decade. Prior to the crisis, Bank of America was largely a commercial bank focused on taking deposits and making loans. Since the crisis, it's become a more equally weighted universal bank because of its 2008 acquisition of Merrill Lynch. The upside to a more diversified universal banking business model with both investment and commercial banking operations is that it allows Bank of America to satisfy more of its commercial customers' needs, be it to make a loan or issue stocks and bonds on the public markets. But the downside is that the trading operations that accompany universal banking are highly volatile. This added volatility translates into a lower valuation multiple. The second reason is that Bank of America's profitability has been dismal since the crisis. In the first quarter of this year, its net income equated to only 0.5% of its assets. That's half the 1% return-on-assets benchmark that most investors associate with a respectably run bank. In short, as long as Bank of America's profitability continues to lag, so too will the valuation of its stock. An investor who takes a glass-half-empty approach will focus on Bank of America's egregiously low valuation as a sign of trouble, but someone with a glass-half-full perspective may see this as an opportunity. I'm in the latter camp.